I will join PHSS in one action per week in response to some emergency facing the hunger strikers, and in resistance to the torture. These actions may include an email, phone call, letter, vigil, and/or activation of my network and will be initiated by the Emergency Response Network of PHSS. Call the Department of Correction’s new ‘public hotline number’ to voice your concerns and support of the hunger strikers: 916-324-3397. Ask your friends to donate too! Write to prisoners to support them! Learn more about the PHSS Human Rights Pen Pals. Visit our website at www.humanrightspenpals.org or email humanrightspenpals@gmail.com for more information. Write to everyone you know in prison and let them know about the hunger strike and the many ways thousands of people outside and inside prison are supporting it. NOTE: Mail referring to the hunger strike is being rejected, so describe the action without using the exact words “hunger strike”. (Example: you can say “refusing food” or “not eating”.) Please be mindful that the Department of Corrections was retaliating against prisoners who received mail referring the strike, before it started (giving prisoners 128 write-ups, which can result in denied parole, job loss, possible SHU placement if the prisoner is not already in the SHU, and more). Now that the strike has started, there is less likelihood of such retaliation if letters are simply informing of the strike and not advocating that the recipient participate in the strike. If you are aware of people participating in the strike at other prisons than those listed below, please contact us at prisonerhungerstrikesolidarity.wordpress.com. It is crucial for supporters of this struggle to share information on updates, developments and ways people everywhere are supporting it. During the first round of the strike, at least 6,600 people across at least 13 prisons participated. The CDCR would not release at which prisons prisoners were striking. 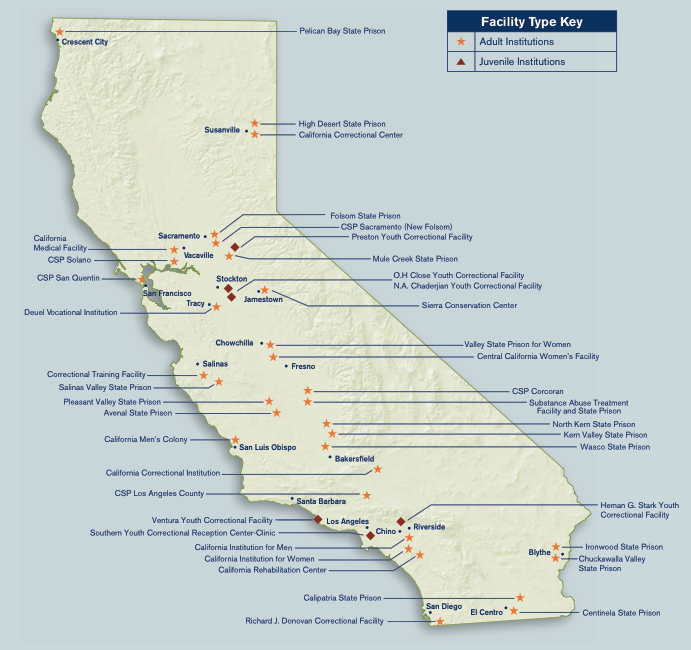 We know prisoners participated in the first round of the strike at Pelican Bay (the SHU & General Population), Corcoran, CCI Tehachapi, Folsom, San Quentin, Centinela, Calipatria, RJ Donovan, Valley State Prison for Women, and North Kern State Prison. During the second round of the strike that began on Sept 26th, we know at least 6,000 prisoners are participating again at Pelican Bay, Calipatria, CCI Tehachapi, Centinela, West Valley Detention Center, Corcoran and Chuckawalla Valley State Prison. Stay informed! Subscribe to this blog from the home page and clicking “subscribe me” on the right-hand side. This is cruel and inhuman, no one should be treated like this!! No one deserves to be in that hole that long!! There should be a law on how to treat humans…. No one deserves to be treated in that hole that long. There should be a law how to treat humans. Pingback: Defend the Right to Protest – Support the Pelican Bay Hunger Strikers! I support the Hunger Strikers. Their goals. And all their family, friends, and those who work and volunteer for their cause. I write with an inmate who’s in Pelican Bay State Prison. Not only are their demands reasonable, it’s also absolutely horrifying how the prison (the government even, maybe?) punish those who protested. This must end. Is it rally so strange to protest this…? Aren’t we all humans… What’s going on here? I wanted to thank the prisoners who brought attention to your requests, at least nationwide, if not world wide, by organizing this type of activism. I have no known associates in prison, yet this very well-done effort has impressed me of injustices and dignity of many humans behind bars. Again, thank you. We the outside supportters will continue to keep on eye on the California Prison System, making shure that Our loved ones are treated like human beings and Their Rights get respected ! I’m glad CDC No longer can practice Long Term Solitary Confinement! and Our goal is to put and End to Solitary Confinement!